Two glasses, two eager, excited glasses drinking from the 2012 Count’s Selection Syrah – Old WInery Road, and two glasses that we could not keep filled this Saturday evening as we gnosh on pan-seared steaks, asparagus, and mashed potatoes. The steaks were excellent, lean and delicious, and left us just a healthy bite for the dog as well. The mashed potatoes were fluffed and had just enough lumps in ’em. The asparagus–were they organic?–were really good but perhaps a bit thin or young. 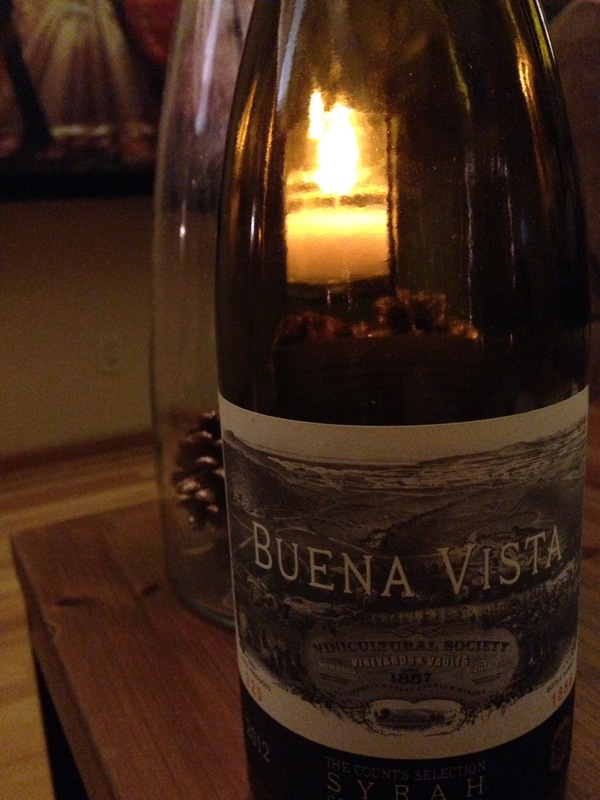 2012 Count’s Selection Syrah – Old WInery Road, Buena Vista, California, USA. But for me? You know the highlight of the meal for this guy was the 2012 Count’s Selection Syrah – Old WInery Road from the team at Buena Vista. My favorite winery and one of Sonoma’s most storied vineyards, tonight they offered our family a fantastic dark, fruity, and spiced syrah. Killer beverage. I’d say plain and simple, but this wine is way too special for that trite phrase. This syrah is fragrant, it’s got one of my favorite pepper flavors, a deep purple color, and amazing taste. I can tell you we did not decant for any period, and the Count was still a really great beverage. We had bottle 1886 of the 325 cases that the winemaker produced. Perhaps one that we should reorder while Buena VIsta will offer a 30% discount? This entry was posted in Syrah and tagged California, california winemaking, Sonoma, USA.